If you read the eligibility requirements of DACA you know that you are eligible only if you have a maximum of three misdemeanors. Well, it turns out that USCIS is not only approving those DREAMers who used fraudulent entry documents, it is also approving applicants with more than three misdemeanors on record. One user on a forum for DREAMers is reporting that "i have 4 Misdemeanor charges on my record for traffic related stuff like Driving under Revocation etc but nothing violent. I consider myself lucky to have went thru" (spelling and grammar mistakes are by the original poster, not me). Basically, this goes on to say that the prosecutorial discretion is powerful and one should not be afraid of applying for an immigration benefit just because one is not eligible. The USCIS officers have a lot of freedom in deciding cases, and in the Border Security, Economic Opportunity, and Immigration Modernization Act of 2013 (BSEOIM) the prosecutors can literally give the Registered Provisional Immigrant (RPI) legal status to anyone even if they do not meet any of the requirements because of the waiver loopholes. Also, do not forget that USCIS offices are understaffed and overworked (you can thank Republicans for never approving enough funds for government that keeps the employees highly discouraged and unmotivated) and some even consider them incompetent and careless for approving Chechen terrorists. Is it possible to switch DACA to other visas? Several DACA approved DREAMers have been asking me if they can change their status to F1 or H1B to legalize their status. Indeed, it is true that the United States immigration laws allow change of status from one visa category to another in limited number of cases (the guiding principle being your intention -- for example, if you applied for a tourist visa and then want to switch it to a job, USCIS is not amused and may insist that you first leave the country), this provision does not apply for deferred action for childhood arrivals. Why? DACA grants no legal status in the US and is not a visa. It is merely a temporary hold on deportations for two years. Those DREAMers who used fraudulent passports and/or visa to enter the United States have been wondering if they will be approved for DACA and eventually for RPI status. Well, while researching the forums of DREAMers, I have come across a case in which an individual who did this has already been approved. This is a process that maybe very familiar for those in the undocumented community. How does the process work? Everyone knows that visas to the United States maybe somewhat difficult to obtain, but they are fairly easy for wealthy people. Once you get the visa, renewals are even easier, and so are adding family members. 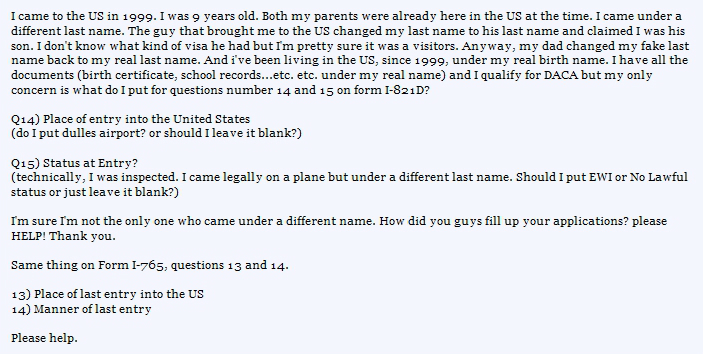 So this DREAMer (I am highlighting a typical example but there are many other people discussing similar cases), whose parents were already in the United States illegally, paid an undisclosed sum of money to an American visa holder, who applied to add him to his visa using a fictitious name and documents. Then he traveled to the US and since he was a child, no fingerprints or photographs were taken. Upon arrival, he simply reverted to his actual identity. In his DACA application, since the US Government had no way to check this, he simply declared that he entered without inspection, and what I found interesting is that he listed the Place of Last Entry into the U.S. as Washington, District of Columbia. After the typical four-month period, he was approved without any questions. So how did the USCIS approve him? Well, as some of the USCIS union members have been pointing out, the agency is in a mess and there is tremendous pressure on them to rubber stamp immigration applications. So, they really are not checking things very well. 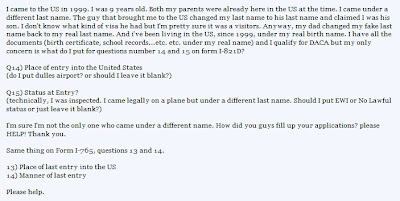 To somehow claim that you entered the United States in Washington, DC (I even read of people listing Miami) without inspection is unusual (most people tend to enter through the land border with Mexico), but looks like the adjudicating officers are under too much pressure to approve applications because of the workload. How to prepare for DACA interview? Tammy writes, "I entered without inspection from the border with Mexico at age 4. I filed for deferred action on Oct 17, 2012 and went for my biometrics appointment on November 20. I provided evidence like school records, medical records, bank statements, church letters, gym records. I do not have a criminal record, I have never been in trouble in any way. All the papers of course were 100% legit. My whole packet was pretty extensive, maybe a good two inches thick. The only thing, was that I was in Mexico my 7th and 8th grades, but this was way before 2007 and I was still a minor. But I had to be honest about it when I had to list all my addresses since my arrival. Other than that, maybe because I was advised to put "undetermined" for my income/expenses since I don't have a paying job. I help my mom with housekeeping but she is the one who gets paid cash. So it's really hard to put down a salary/income since I technically don't have one. I recently received a letter to attend an interview. I don't know why I am being interviewed... I also don't know what to expect? Do you know anything about DACA interviews? Would you think my two years in Mexico is what caused for the agent to call me for an interview? I am quite sure my parents are not keeping anything from me. I've never been deported or anything. If they don't approve my case for whatever reason, would they be able to take me into custody and deport me at the spot? My family is also concerned about me being deported and what would happen to them. Would they be deported also, more specifically, would ICE be able to knock on my door and take them? Please help." Why is DACA ordering DREAMers to interviews: You might have been picked at random for an interview as part of a quality control program (I am a bit concerned, though, that it took so long for your application because, if you are telling the truth that yours is a straightforward case, these are approved in about 3 months and then without getting an RFE you have been asked to go to an interview). Also, while you may think that your case is genuine and all your paperwork is authentic, maybe there is something in your application that makes the officer think that it is fraudulent, or something does not add up and looks suspicious. A very remote possibility is that someone with your name and/or background is wanted for a crime and they just want to make sure that it is not you. Relax. If you have done nothing wrong, there is nothing to fear. Review your DACA application package and be prepared to answer each and every question. The officer can ask you anything related to the application. I also want you to review your application for mistakes. Sometimes we all can mess up dates and numbers. Bring originals of all the documents that you have submitted. Be on time. Dress professionally and treat the officer respectfully. Do what you are told. Do not bring electronics (and definitely no weapons) to the Federal building. DO NOT lie. I repeat, regardless of what anyone is telling you now, tell 100% of the truth, because nothing is worse than lying under oath to a Federal officer, particularly if you are undocumented. You will get into more trouble if you are caught lying than for breaking the law. Make sure that you follow the instructions in the letter for the interview, so if they have asked for something, bring it along. You will have to clarify that your mother is the one who pays all the bills but if you did not indicate that you had any expenses, it is a good idea to type on a sheet of paper what your expenses are, for example, cell phone bill, share of your house rent/mortgage, meals, school, etc. Inaccurate information about DREAMers: Is there a possibility that your family has not told you the whole truth? There have been instances of parents not sharing all the details, either because they did not think it was necessary to tell the kids, or that they did not know English and threw the letter in the trash, or did not fully realize the implications, for example, of simply declaring that their undocumented child was actually a US citizen. There are stories of how the parents completely ignored deportation orders and even threw away the paperwork or changed names (it is not enough to deny your case but if you did not disclose this, that would be a problem). Worst case scenario: At this point you have no choice but to deal with the interview. The worst that can happen is a denial but if there was no fraud involved and no criminal record, USCIS will most likely leave you alone for the time being. In any case, if your application is denied, as are hundreds of DACA cases denied, most likely you will get a letter in the mail and nothing else will happen. Right now, the government is focusing on deporting only people with criminal backgrounds so if you and your family are clean, nothing is likely to happen to them. Unless you or your family members are wanted for a crime, you will not be arrested and deported. The point to note, though, is that an undocumented person can be arrested and deported at any time, legally speaking, but just being called for an interview does not increase that probability. No one is aware of what to expect during a DACA interview but it is no different than any other immigration case interview at the USCIS offices. So just to prepare, you will be in front of an officer on a desk in an office or cubicle, you will swear to tell the truth, and then all you have to do is just answer all the posed questions truthfully. Remember that you have to assume that the USCIS knows everything about you because using all sorts of records they can find out things about you that you might not expect. Most likely you will not be given a decision on the spot and will have to wait for a letter to arrive later. While DACA approved DREAMers will be protected from arrest for being in the USA illegally, the good news is all those of you who have not applied for DACA but are waiting to apply for RPI status directly, there is nothing to fear. There is a provision in the law that if a law enforcement officer inquires your immigration status all you have to declare is that you are eligible for RPI. There is no need to show any documents that proves that you have even applied for legalization. You will not be arrested or deported as long as you make this claim. If you are still arrested, you can actually sue the Government and get a free attorney because this is against the law. Obviously, it is important to understand that this is only for immigration violations and not for other laws that you break. For those of you who live in the border stats, you must be familiar with immigration checkpoints. The US laws allow Border Patrol to check immigration status within 100 miles from the border. Accordingly, DACA approved DREAMers should always carry their EAD card and present it to the officer as proof of their status in the United Status. A document from the USCIS that your application is pending maybe accepted by an agent out of kindness but is actually a confirmation of your undocumented status. Those of you whose applications are not yet approved should avoid check points. Whether approved or not, needless to say, you should never cross the border. Only DACA approved DREAMers with a valid advance parole document are allowed to re-enter the country.